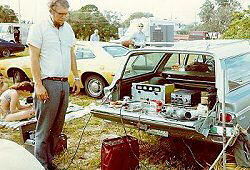 The Apollo crews transmitted footage to Earth using SSTV, a ham radio technique that amateurs and pirates can use to send similar messages around the world. Did NASA have any technical countermeasures in place to ensure that the signal they received from the Moon was legitimate? Or did they just assume that nobody would try to interfere? 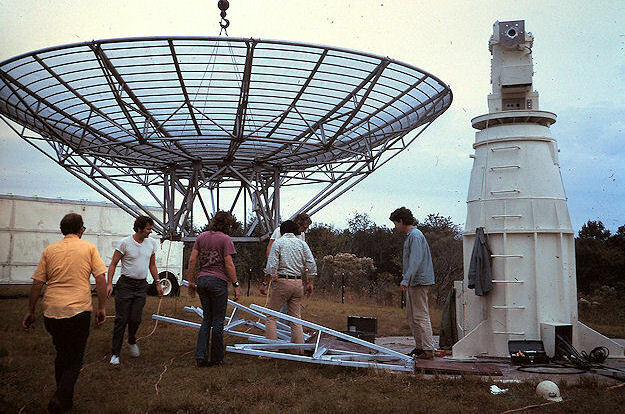 The signal from the Moon was received using giant parabolic antennas, e.g. the 64-m dish at the Parkes observatory. These have very good sidelobe rejection so they won't pick up any Earthbound signals. Despite the space race, relations with their biggest enemy were good enough that the Russians shared Luna 15's flight plan with the Americans when this mission coincided with Apollo 11, so both could make sure there was no interference. So there was no need for technical countermeasures. For a period of five days, from 17 to 21 July, the Observatory, Visitors' Centre, and all access roads for several kilometres from the telescope were closed to the general public. This was to prevent any outside interference from cars and other devices from disrupting the signal reception. Federal Police officers secured the site, and to gain access staff members were issued keys with "A 11" inscribed on a small aluminium key-tag. The difference between 10 W at 350,000km, and 1,000 W at 1km is 131 dB. 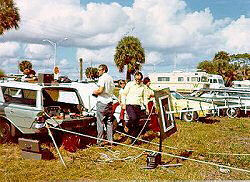 If the pranksters on Earth used a directional antenna like the Ham radio operators shown below, the ratio would be even higher because that thing has much more gain than the Apollo antennas from the orbit and surface of the Moon. It would only take a tiny bit of random or isotropic scattering from the secondary of the dish on the earth to reflect some sideways-propagating prankster signals into the feed horn of the receiver, so this would actually have been pretty easy to do. Dishes don't have 130 or 150 dB of side lobe suppression as suggested here, so this kind of pranking would have been trivially easy. 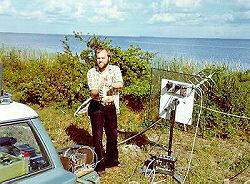 However, in the late 1960's there was such near-universal enthusiasm, patriotism, exhilaration and excitement about the Moon landings that the idea of "pranking" them would probably never have occurred to anyone, and Ham radio operators are generally a noble lot as well, especially back then when there was mutual respect between the FCC and the public, unlike more recently. EDIT: Thanks to @MartinJames's comments I've realized that while interference like this could certainly have posed a problem and resulted in what's better characterized as "jamming", it would not likely end up as successful "spoofing". GPS spoofing works (for example) because the GPS receiver has a wide dynamic range and a teeny-tiny micro-controller, while in the case of the Apollo mission there was a crack team of attentive human specialists monitoring every aspect of the signal. If the strength were off by several tens of dB somebody would surely have said "hey, wait a minute!" and it would no longer be proper spoofing. From the question Why such a large observed Doppler shift from Apollo 17 orbiting the moon? 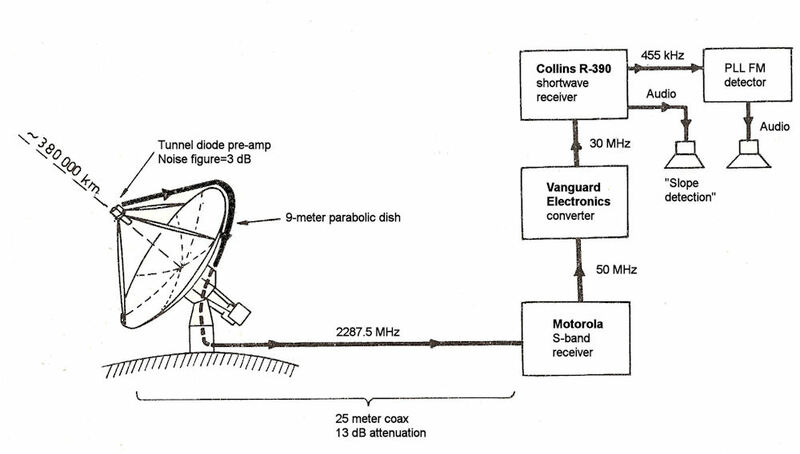 Ham's setting up a 9 meter dish to receive signals from the Moon, and a Doppler shift measurement (offset) of the received signal at around 2287.5 MHz as the spacecraft orbited the near side of the Moon. From Tracking Apollo-17 from Florida. My guess is that the RF hardware needed to do this would have been prohibitively expensive and hard to get working for people who didn't have a long history of cooperating with the US government (or Bell Labs). Cheap, capable open-source hardware and software would make something like this fairly straightforward now - but Moore's Law had just been coined in 1965, and it's never really pushed the capabilities of RF hardware like it did computers. Not the answer you're looking for? Browse other questions tagged nasa apollo-program communication radio-communication amateur-radio or ask your own question. Why such a large observed doppler shift from Apollo 17 orbiting the moon? Why were there beeps punctuating the voice communications during missions such as Apollo? How does NASA get information from space probes? How does NASA communicate to spacecrafts? What purpose serve the audible “bip” on apollo radio communications? How did the Apollo Lunar Module ascent engine prevent gas bubbling through fuel? How did the Apollo Moon rocks get away from NASA and into the public? How did the Apollo Service Module reenter?